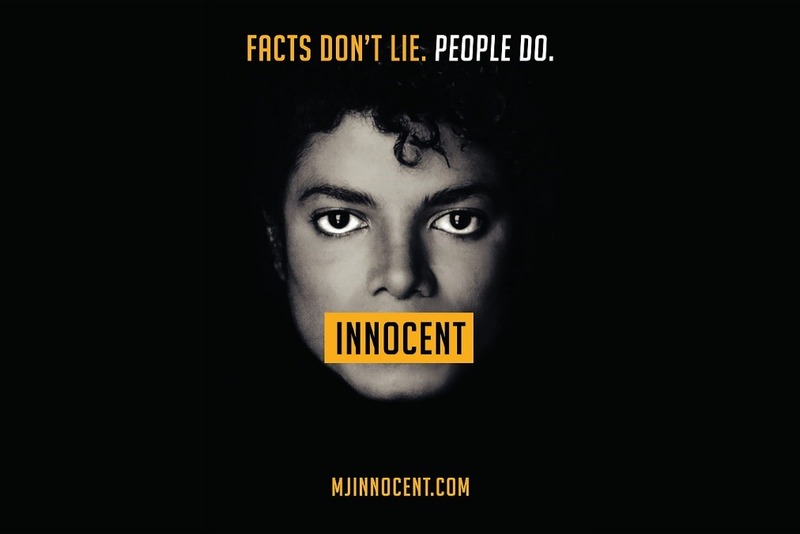 The website MJINNOCENT.com HAS LAUNCHED! 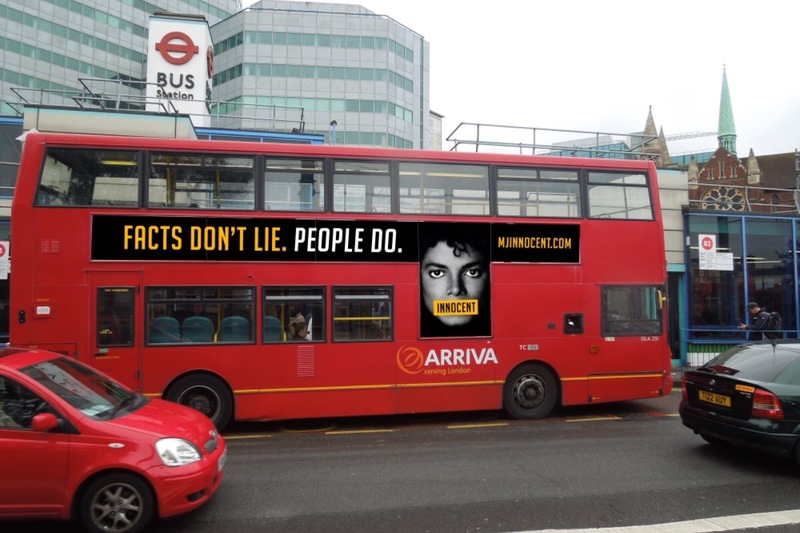 In response to the propaganda film #LeavingNeverland, I decided to come up with the idea of having adverts placed on the sides of British buses, showing support for Michael Jackson, both in London and around the country. Firstly, it's important to know this. I do not believe that Michael Jackson was ever guilty of the allegations against him because I like his music or appreciate his artistry. I do not believe he wasn't capable of the crimes alleged, because after a few beers I think I can master the Moonwalk. Like countless others within the MJ Community and society in general, we would not think twice in turning our backs on his legacy if we for one second felt that there were any truth at all in these heinous events, especially being a father myself. The truth is, I am genuinely more interested in principles and the moral wrong that has overcome media outlets recently, in their attempt to vilify a dead black man and drag his life's work and reputation through the mud - based on seriously questionable declarations from people who stand to gain a lot financially from their untruths. So, in relation to the London buses - they are iconic and instantly recognisable across the world. Having our messages captured in this way offers the public an opportunity to discover another side of the story, one that's been conveniently omitted from the Channel 4 film. The buses will provide passers by with the chance to take pictures and share on social media, promoting the genuine belief that there is a huge group in society that believe and know Michael Jackson is INNOCENT. Please see the 'Updates' section above to discover where we are up to with the campaign. I am so proud of everyone's continued support so far, and blessed to be part of this magical and diverse community. If you're feeling extra generous, please consider making a donation to Taj Jacksons proposed rebuttal film to the Leaving Neverland fiasco here. Like us, Taj need's all the help he can get in ensuring his campaign gets off the ground. Seány and the #MJINNOCENT Team: Anika - Advisor, Alba, Greg and Steve - Website and content creators and Hayden who put together the dazzling bus designs. 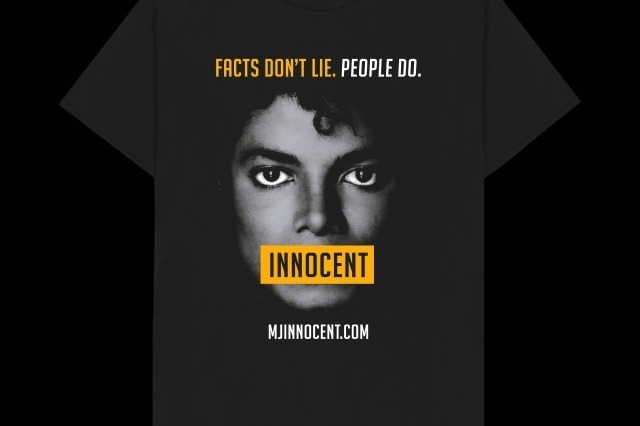 Several weeks ago, MJINNOCENT.com attempted to respond to the hundreds of requests for official merchandise. We had some initial problems when we began, and the demands became overwhelming. Being such a small team, we had no choice but to put the clothing project on hold, whilst we focused on promoting the campaign in other ways and extending it all across the globe. It saddens us to learn that fake MJI clothing bearing our campaign details have been sold to fans, misleading them and providing poor quality clothing and designs. The requests to MJI for t-shirts has not dwindled; in fact, it’s our number one daily request. As MJI continues on expanding our international message of truth, we have found the best offering out there that is close the design and branding as possible, is one we found on Etsy. The shop owner has agreed to give the profitable proceeds directly to the MJI campaign, therefore we recommend this store over the many other MJI imitations out there. We can now officially confirm that via Etsy, fans will receive the best quality apparel and all profitable proceeds will go directly to the MJI campaign, therefore we recommend this store over the many other MJI imitations out there, none of which have been given authorization by the Jackson Estate. Our GoFundMe page has started to slow down a little, which means we are limited in what kind of publicity we can guarantee in taking MJI further. With t-shirt sales and ongoing donations to GFM, we hope that the world continues to see that we are not going anywhere. For as long as the hate exists, we will help to be the blanket of truth that smoothers the darkness. It’s MJI’s aim to get the whole world wearing MJ INNOCENT t-shirts. The best place to start is with you! I come to you all with some extremely exciting news. The past month has seen not only the birth of the campaign, but it’s extension to all corners of the planet. Countries have been busy promoting the truth via billboards, banners, fliers, news coverage and bus adverts. Only weeks ago, we suffered what had felt like our first major set back at the time. We discovered that the free national daily newspaper in the U.K decided to not run our campaign at the last minute, for fear of not appearing “impartial.” The Metro newspaper had no problems slandering Michael Jackson on numerous occasions with the most outlandish and obscene write-ups; therefore in hindsight we were relieved to not be associated with them. 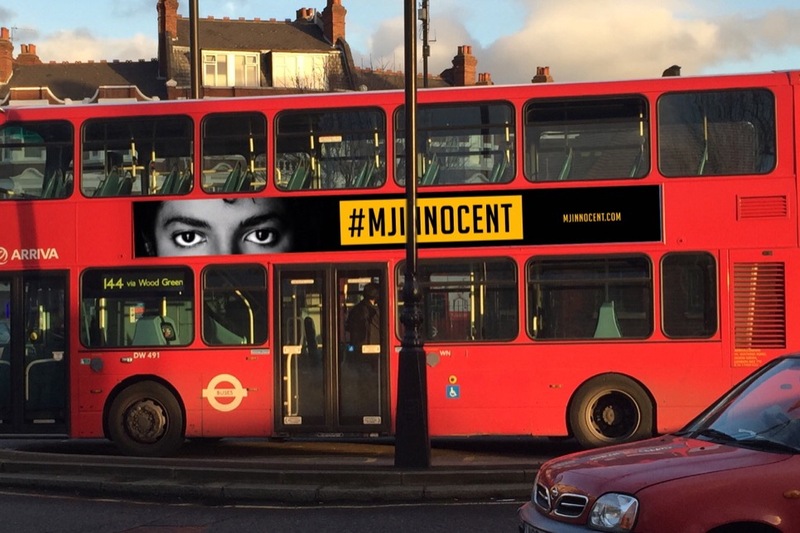 In the midst of our London bus campaign being halted by TfL (Transport for London), the dedicated #MJINNOCENT team have worked tirelessly around the clock, participating in interviews, managing website correspondences via the website, fighting for a refund and dropped an open letter to TfL and the Mayor of London. 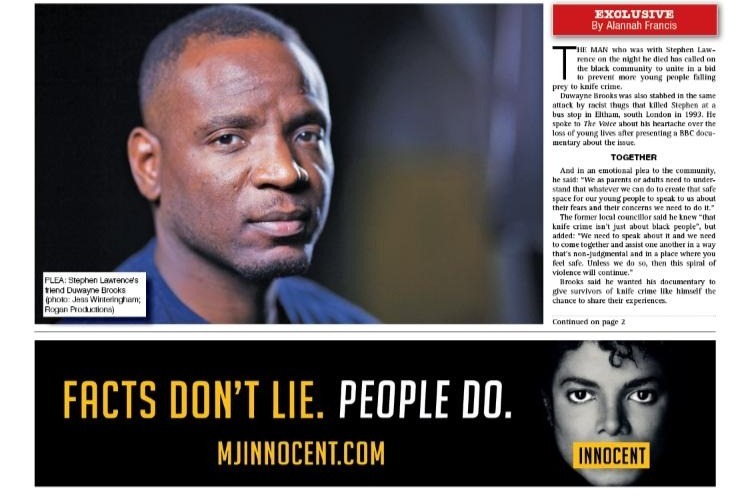 In that letter, we made it clear that we will not accept their decision to pull our adverts, which totally compromised our right to free speech not to mention disregarding the presumption of innocence in relation to Michael Jackson. The latter two of these matters are still on going and we hope to have further updates very soon. We have been exploring new ways to expand on the message we had vowed to do from day one, and that was to ensure the other side of the story is easily accessible to the public. I can now officially reveal, that from Thursday 21st March, a national multi-award winning newspaper in the U.K will feature the #MJINNOCENT campaign on the FRONT PAGE of their paper! ‘The Voice News’ has always led the way in championing diversity and being a voice for those without one. They are an established media giant who are proud to report on news to the community for the community. 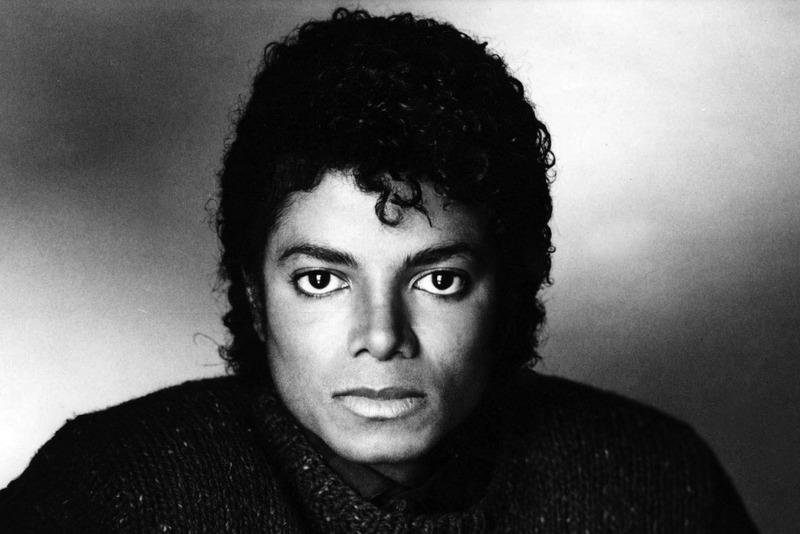 We applaud The Voice for joining us in fighting for the world's greatest black luminary, Michael Jackson. We are extremely proud of this fitting partnership; especially as the newspaper will work to ensure the person no longer here to defend himself is given a ‘voice’ across all of their media platforms. Just as Leaving Neverland continues to be broadcast around the world, we are ensuring that our campaign shows no signs of slowing down. Please do purchase your copy of ‘The Voice’ newspaper in the U.K tomorrow where it will feature #MJINNOCENT on it’s front pages and will be available for a week in stores. Days ago, we discovered that our #MJINNOCENT London bus campaign had been brought to an abrupt end. It was done in the most public and disrespectful manner, not via an official announcement via TfL themselves. Instead, the decision was made aware to us on Twitter and from people unrelated to TfL or the #MJINNOCENT team. 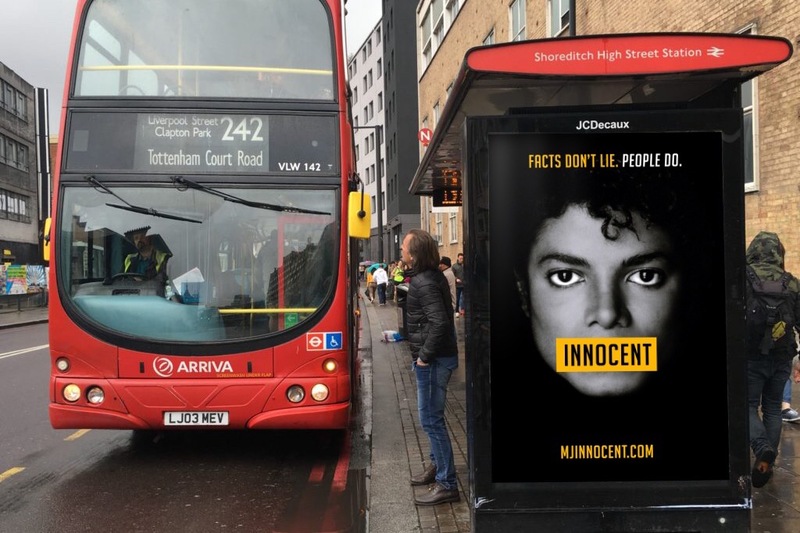 Please find included, a link to an open letter to TfL and the Mayor of London Sadiq Khan, explaining why MJInnocent believes that the decision to remove the Michael Jackson adverts from London buses is unacceptable and must be revoked. We believe that the issue is now greater than simply the false and malicious accusations being leveled against Michael Jackson; the actions of TfL and the Mayor have serious ramifications on free speech and the right to be presumed innocent until proven guilty. It's been a colourful 24 hours. Late last night, the #MJINNOCENT team received news on Twitter that our London bus adverts had come to an abrupt end. Across social media, fans reacted in disbelief and dismay at the decision, rightly so. We too felt your frustrations, especially as only hours before, we were continuing our negotiations with TfL to run our adverts throughout the London underground. Earlier today, we were given the official word that no underground adverts would be happening and that our bus adverts would be pulled. It's important that you are all made aware of the following below and what's next in store for the campaign moving forward. Make no mistake, this is a blatant attempt to silence Michael Jackson and to silence our campaign, but we will not allow that to happen. In fact, we are just about to get much louder. We believe TfL’s decision is an attack not only on free speech, but on the principle that a person is innocent until proven guilty and we think that’s a dangerous position to take. We have made clear time and time again, that our campaign is very specific to the miscarriage of justice being inflicted upon Michael Jackson and it is not a commentary on sexual abuse at all. Any genuine victim must be supported and any genuine victim should be taken seriously, but they should expect due process to be followed, that’s what we should expect in civilised society. The falsely accused are real victims too, and it makes it profoundly unfair to them when they are no longer here to defend themselves. The #MJINNOCENT team are very disappointed about the way in which this whole process has been handled. Our bus campaign has been unfairly cut short and taken away from us so publicly and disrespectfully as evidenced across headlines on social media . We have all paid for this with our donations, and like any customer, we have a right to be treated fairly and respectfully. Shockingly, this has not been the approach from TFL which we find deeply offensive. We are currently in the process of considering legal action against TFL for their management of the matter and we will inform you when possible. Despite this update, there has been lots of positive news that has since developed; the irony being that the recent furore has generated further publicity for #MJINNOCENT all across the planet. Traffic to our site continues to grow daily at an epic rate. We may have a small team, but rest assured, our reinforcement is global. We launched the official Twitter account @MJInnocentUK and our cause has triggered even more support in helping to initiate new campaigns in various countries. Additionally, it has opened up new advertising opportunities and we are currently exploring some exciting offers that we know you will be extremely pleased about. We will have an update on this news in the coming days. We are continuing our talks with the advertising agency and TfL regarding any refunds and have been told that we might get a pro rata amount refunded back to the campaign. These discussions are ongoing. Please note that the campaign's vision continues to grow and we have our sights on expanding promotion throughout the U.K. To anyone who thought having our campaign featured on the sides of buses was a big deal... just wait till you see what we have in store longterm with the help of donations. Finally, it is our understanding that right now all of our #MJINNOCENT buses are still in operation. They will be running tomorrow, all weekend and right through to next weekend of the 23rd/24th March, when they will eventually come to an end. Social media messages posted from opposing groups insinuating they have already ceased is nothing short of scaremongering. We proudly ask you to continue to take pictures of our buses, share on social media and the world, and actively demonstrate that the innocent in our campaign will never be silenced as long as he has an army like us fighting in his corner.